This entry was posted in General News and tagged Rainwater, sustainability on September 17, 2013 by Wire Eagle. AUBURN UNIVERSITY – Stormwater runoff in urban areas has long had detrimental effects on the environment as buildings and pavement prevent rainwater from filtering into the ground the way it does in a forest or natural field. In an urban setting, the water runs off into storm drains, collecting pollutants on its way downstream. On the Auburn University campus, the water flows into Parkerson Mill Creek, on to Mobile Bay and ultimately into the Gulf of Mexico. Pulling together funding from Auburn’s Facilities Management and a Parkerson Mill Creek grant, a team of Auburn experts has developed a way to mimic that natural infiltration process. On a shop building adjacent to Dudley Hall, rainwater is collected through a draining system and flows to a 1,000-gallon cistern. The overflow water is diverted to a neighboring rain garden, where it collects and seeps slowly into the ground. Charlene LeBleu, associate professor of landscape architecture in the College of Architecture, Design and Construction, led a team of students in designing the project and selecting the plants that thrive in a rain garden environment. Building science students built the conveyance system that carries the water from the cistern to the garden. Over the next three years, the team will monitor the chemical analysis of the roof water, particularly the level of nitrates in the water, and measure the infiltration of the water through the rain garden. 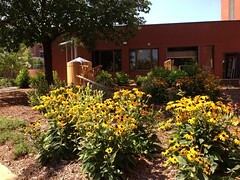 They also will see which plants grow the best and how effective rain gardens are in clay-type soil. Similar projects have been built at Auburn’s Southeastern Raptor Center and Donald E. Davis Arboretum. For related links and images, go to the Auburn University website at http://ocm.auburn.edu/featured_story/rainwater.html.